One of the many unsung features of the Steam desktop gaming client is that family members and friends can use it to simulate a shared gaming console. I’m not talking hardware here, but the ability for everyone to play the same games regardless of whether they plunked down $60 for the right to play it. The feature is called Steam Family Library Sharing, and when it’s set up it allows you to share games from your account library with family members and vice versa. Before you get started, every account that wants to use family sharing must first have Steam Guard enabled, which is Steam’s two-factor verification security feature. You can enable Family Library Sharing with a few clicks. Once you’ve met that prerequisite, click on Steam > Settings, and when the Settings window opens select Family from the left-hand navigation column. Under the sub-heading Family Library Sharing click the box next to Authorize Library Sharing on this computer. If there are any other local Steam accounts on that computer, you’ll be able to authorize those users to play the games in your library. You can also send a request to other local players to have access to their libraries. For those of you without other local accounts on your PC, try it with friends. When someone you want to share with comes over, log out of Steam and have them log in. They can then enable sharing on your PC and authorize your account to play their games. While games can be shared, progress, achievements, and in-game purchases (excluding DLC) cannot. Any in-game activities are saved to the account playing the game, not the game owner’s account. 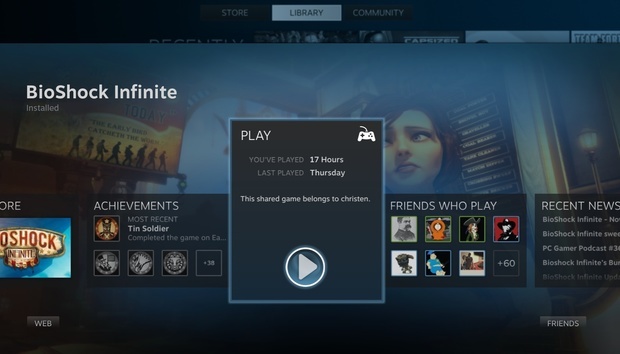 Steam limits users to share their libraries with up to five others and on a maximum of 10 devices at one time. Family sharing cannot be used to allow access to specific games—it’s the entire library or nothing. Other people can only play your games when you aren’t using them. If you start to play one of your shared games at the same time as someone else, the other person will be given a few moments to save their progress and get out or to buy the game themselves. Not all games are available for sharing due to technical limitations, regional restrictions, subscription requirements, and the like. Also keep in mind that you don’t want to share you library with anyone who’s got a fishy reputation. Valve is merciless when it comes to cheats. If someone uses your account to cheat at a game protected by the Valve Anti-Cheat system, and gets caught, your Family Library Sharing privileges could be revoked and you might get banned from playing that game altogether. Even with all the caveats, Steam’s Family Sharing is a great way to expand your library without tapping your bank account.